Sting and keyboardist David Sancious have known each other for more than 20 years and in this latest Virtual Ticket video, the two discuss their working relationship and what it's like to be back on the road together for the Summer 2012 tour. Check it out here! Great David....I can't wait til July 13.......I'll see you in Taormina......WOW!!!!! Mr sting please add more uk dates, so more of us can see this great line up. Yes Sting, David is an elegant pair of gloves. 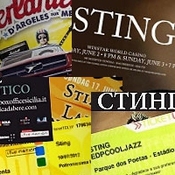 Great clip Sting.com, thank you; and thanks STING!